Provides 30mg of elemental zinc per tablet. Recognised efficacy for preventing and treating diarrhoea. Broad-spectrum efficacy (acne, burns, colds, depression, gingivitis, cramps, ulcers). L-OptiZinc® is a unique, patented form of methionine-bound zinc, the amino acid best absorbed by the body. Studies show that OptiZinc® is better absorbed, retained longer and is more effective than any other zinc supplement. What's more, in contrast to other zinc supplements, the bioavailability of the zinc is not affected by the type of food or amount of fibre consumed. It also has greater antioxidant potency, equivalent to vitamins E, C and beta-carotene, offering effective cell protection against free radical attack. Zinc is a trace element essential to a number of vital cell functions including growth, development, reproduction and digestion, as well as cerebral, nervous, immune and visual functions. - is essential for growth and maturation; deficiency is linked with cognitive deficits and delayed growth including a delay in male and female puberty. 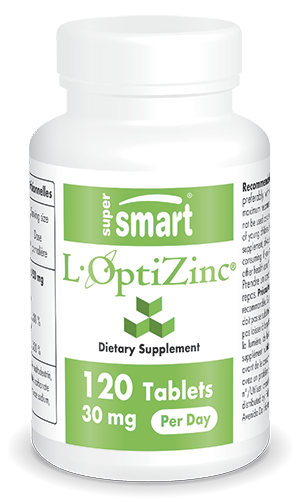 Each tablet contains 150 mg L-OptiZinc®, providing 30 mg elemental zinc. Ingredients: L-OptiZinc®, microcrystalline cellulose, magnesium stearate, silicon dioxide. L-OptiZinc® is a registered trademark of Interhealth NI (US patents 4,764 and 5,278,329).